Not the live fish, although getting brushed by one when I'm swimming in a lake is enough to raise an unearthly shriek from somewhere deep in my gut. No, I'm talking about cooking fish. I know that eating fish can be good for you, and I've been working up the courage to cook it on a more regular basis. (As in, more than once a year or so.) I still find it daunting, though, to walk up to the meat counter in my grocery store and walk away with some fish that I have absolutely no idea what to do with. That I am sure I will overcook and make dry and that will make my house stink. It's frightening, I tell you. Those of you who are skilled fish-cookers, you are probably shaking your head at me right now. There really is nothing to fear from cooking fish, and I recognize that it's a weird phobia. I'm hoping in a little while to be a skilled fish-cooker myself. For now, though, I'm coming clean with my fears and trying to work past them. If you are at all like me and find fish intimidating, these salmon cakes are a great, tasty first step toward getting fish in your diet. They are made with canned salmon, which has all the salmon good-for-you fatty acids and vitamins but without the oh-my-gosh-I-just-bought-a-fillet fear factor. Canned salmon is fairly inexpensive, and it is much easier to find the wild Alaskan caught salmon (more sustainable, better for you) in a can than fresh where I live. Just a quick note of warning - some canned salmon comes with bones and skin in them. They are both edible and some people swear by the taste and nutrition they add, but if you are like me you will probably want to get the cans/pouches marked boneless/skinless. Using canned salmon means making these salmon cakes is fast and easy. It's actually a great recipe to have in your recipe binder because you can easily keep the ingredients for it on hand to make when regular dinner plans fall through. What I love about this recipe compared to other salmon patties is the crushed tortilla chips. Most recipes use bread crumbs of some sort, but I love the flavor the tortilla chips give to the finished patties. The cumin also makes this dish special, especially when eaten with the corn salsa. It's not a very fishy tasting recipe, either, so if you are on the fence about eating fish, this might be a good recipe to try. Heat the oil in a medium non-stick skillet over medium heat. Mix salmon, green onions, tortilla chips, egg, green chiles and cumin in a medium bowl. Place flour in a small, shallow dish. Add the patties to the pan and cook 3-4 minutes on each side or until well browned. Remove patties to a plate and wipe skillet clean. Add the salsa and corn kernels and stir and mixed until heated through. 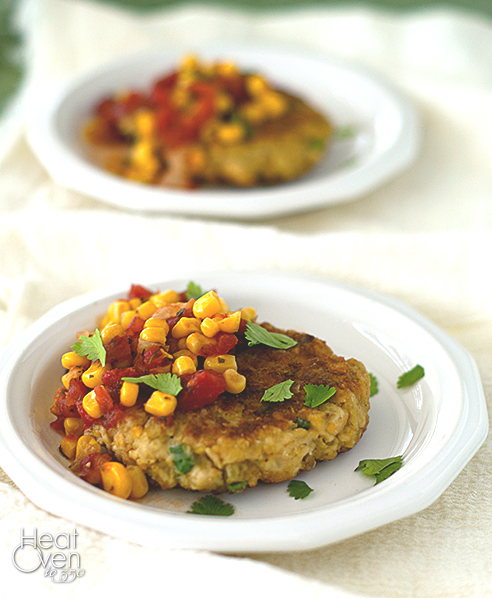 Serve the salmon cakes topped with corn salsa mixture and cilantro. This will probably sound weird, but I'm more afraid of buying fish than cooking it. I never know for sure that what I'm buying is fresh/sustainable and it totally stresses me out. We can work through our fear together :) I love these salmon cakes as an easier alternative with a lot of the same benefits! 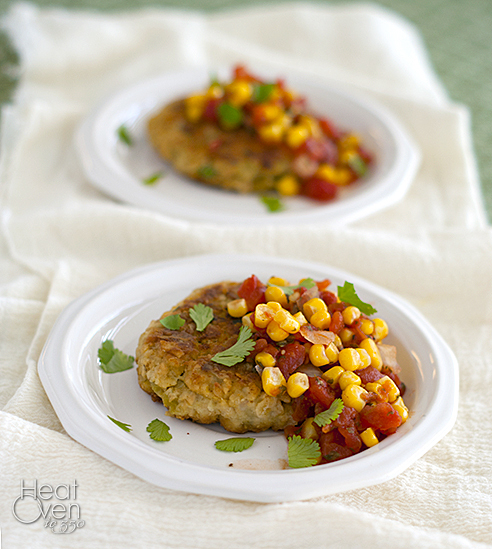 I actually have tuna cakes on this week's menu so we're on the same wavelength! I've never been a huge fan of fish but I started eating Salmon last year and make it regularly now. I usually overcook it on the stove but I found roasting it to be totally foolproof. Just add spices, drizzle on a little oil and lemon juice and roast at 450 for 12-15 min. Comes out perfect every time! My mom used to make salmon cakes but I never found her recipe. I love the southwestern spin on these! Oooh, I can't wait to try that, Emily. It's so simple! Thanks for the tip. Salmon cakes are def a good way to start overcoming your fish aversion, hehe. These look so good! But you really have nothing to be scared of...fish is way simpler than chicken! Just put some fillets on a baking sheet with some spices, and maybe a little schmear of something on top, and you're good to go! I know it sounds weird, but growing up my mom would always get a thin white fish, then top it with a mixture of sour cream and ketchup (kinda like russian dressing) and a sprinkling of paprika. It makes the most moist, tender fish ever!